Shortly after 3 a.m. on 15 August 1975, the plotters gathered in the Dhaka cantonment to go over the final details of the operation against Bangabandhu Sheikh Mujibur Rahman and his government. In a strangely inexplicable manner, the plotters had asked for, and been given, permission to take their tanks, gifts to Mujib from Egyptian President Anwar Sadat, out in those quiet hours in what was given out as a routine exercise. What was curious about the request was that no one in the senior ranks bothered to know why the exercises needed to be done at that particular time. 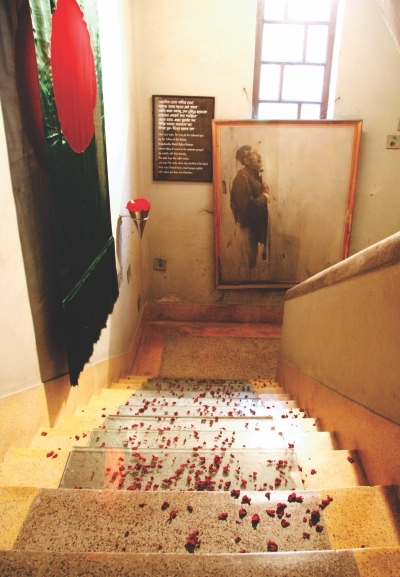 The staircase where Bangabandhu was assassinated. The plotters swiftly covered the stretch of road before the Rakkhi Bahini headquarters, rumbled past Ganobhavan, the president's office, and turned left. Straight ahead lay the short distance to Dhanmondi Road No. 32, where the president and his family, as were the rest of the nation, in slumber. Road No. 32 led off the main Mirpur Road, on which was situated the Kalachand sweets shop. A few soldiers quickly climbed to the roof of the building and placed a few machine guns there. The guns targeted Bangabandhu's residence, quite visible from the place. Meanwhile, a few tanks stopped at the head of Road No. 32. A few others went in, coming to a stop at the gates of the presidential residence. The first group of soldiers alighted and ordered the security personnel at the gates to let them in. The presidential guards, completely taken by surprise, refused and were swiftly mown down. Meanwhile, other soldiers arriving before the house began firing into the residence and at the walls, obviously to generate as much panic as possible. The sounds roused Bangabandhu and his petrified family as well as the entire neighbourhood. Sheikh Kamal quickly rushed down the stairs and ran smack into some soldiers who had already come in. He was shot. A young boy who worked as a servant was killed as well. Meanwhile, Bangabandhu was frantically trying to contact the army chief. Finally, when he got through to him, he told him tersely that his family was under attack from soldiers and needed security. General Safiullah, in what was surely one of the darkest moments in his life, proved unable to help his president. He asked the pretty pointless question, 'Can you come out of the house, Sir?' The next call made was to his security chief Brigadier Jamil. The brigadier, who had only been repatriated from Pakistan the previous year, rushed out in his dressing gown and pyjamas, got behind the wheels of his car and drove toward the president's residence. Bangabandhu's helplessness was complete when the telephone lines at his residence soon went dead. The commotion downstairs prompted the president to emerge from his bedroom, in his white kurta and lungi. As he stood at the top of the stairs, a major was seen running up. He suddenly stopped when he saw Mujib standing there, a looming presence. The officer, suddenly nervous, stared. Mujib demanded, 'Where is Kamal? What do you want?' The major, Bazlul Huda, stammered, 'You have to come with us, Sir'. It is not clear what response came from Mujib. There can be no knowing what he thought as he stood facing a shaky major Huda there. Suddenly, another major, Noor by name, rushed up, must have made a shrewd guess of what was happening and shot Bangabandhu in the chest and stomach. The impact led to the president's rolling down the stairs and coming to rest at the landing that led to the ground floor. He was dead. One of the bullets had gone right through his stomach and emerged from his back. Blood streaked the walls and the staircase. The sound of the gunfire brought the president's wife Fazilatunnessa running out of the room. She was immediately shot down. Her lifeless body lay sprawled between the room and the corridor. Once Bangabandhu and his wife were dead, the soldiers ran riot all over the residence. They stormed the rooms of the house looking for the other members of his family. Some of them had lined up a few individuals, one of them a personal employee of the president, by the wall near the gate and in due time Mujib's youngest son, Russell (who had been named by Bangabandhu after the British philosopher Bertrand Russell) was brought there. The ten year-old boy, shivering in fright and wailing to be taken to his mother, was made to stand in the line. He asked the personal secretary, Mohitul Islam, if the soldiers were going to kill him. Islam, terror struck himself, nevertheless reassured the boy that he was safe. In the house, the remaining members of the president's family comprising his second son Jamal (a lieutenant in the army who had recently returned after completing a course at Sandhurst in the United Kingdom), Mujib's newly-wed daughters-in-law and his younger brother Sheikh Naser) took shelter inside the bathroom attached to the main bedroom of the residence. It did not help, as the soldiers soon broke down the door and sprayed them all with machine gun fire. The bodies fell in a heap. Outside, as Russell kept asking to be taken to his mother, one of the soldiers, in a moment replete with unmitigated cruelty, brought him upstairs, across the body of his father on the stairs and to the spot where his mother lay dead. Without further ado, the soldier pumped a round of bullets into the boy's head. Meanwhile, the president's chief of security, Colonel Jamil, who had earlier left his home when he heard of the attack on the presidential residence, approached Road No. 32. He certainly did not know that by then the whole family had been wiped off. Soldiers stationed there stopped him at the entry to the road and asked him to turn back. He refused. The soldiers promptly murdered him in his vehicle. The killings were over before dawn broke. As the Islamic call to prayer was heard in the mosques of the city, the assassins went about ransacking Bangabandhu's house, laying hands on everything of value they could find. One group of assassins drove off to the residence of Khondokar Moshtaq Ahmed in the old part of Dhaka to inform him that Mujib and his family were all dead and that it was time for him to take over. Down the years, there have been reports, unconfirmed, that since Moshtaq would not take over as president unless he was sure that Mujib was actually dead, he was taken to Road No. 32 to see the body of the fallen leader. In the cantonment, the assassins swiftly got in touch with the senior figures of the army. Early on the morning of 16 August, they collected the bodies and placed them in rough, makeshift coffins. Except for Bangabandhu's body, which bore as many as seventy bullet marks, all the other corpses were hastily buried in the cemetery in Banani. The Father of the Nation's body was flown by helicopter to his village, Tungipara, where the accompanying soldiers made it clear that they wanted a quick burial. They cordoned off the entire village to prevent people from attending the namaz-e-janaza out of fear of a backlash from a constituency that had been Mujib's own since his foray into politics in the late 1940s. The soldiers ran into opposition from the cleric who would lead the funeral prayers. The body, said the cleric firmly, could not be buried until it had been washed and placed in a shroud according to Islamic tradition. The soldiers, jittery and nervous, asked him to make it fast. As no soap needed to wash the president's body could be found in the village, the cleric made do with a thick ball of rough soap usually used for washing clothes. Late in the afternoon, the body of Bangabandhu Sheikh Mujibur Rahman, founder of the independent state of Bangladesh, was laid to rest beside the graves of his parents in the village where he had been born fifty five years earlier.